Go to the bottom of the world and (almost) to the top. You’ll be cool. Alan Nawoj, S.M. 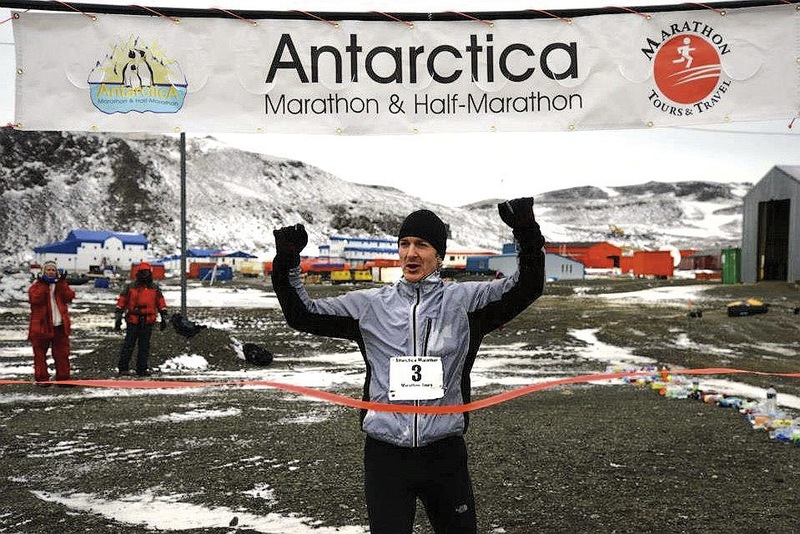 ’04, a developer of mobile application software from Lexington, Massachusetts, was one of 92 punishers of the flesh from nine countries to endure temperatures around 22 degrees Fahrenheit while negotiating the icy course of the Antarctica Marathon on March 30. Nawoj, 33, who has a personal-best marathon time of 2:52:27, went on to win in 3:29:56. “It was certainly the most difficult marathon I’ve ever done,” he reports, “and it was a true test of mental and physical fortitude.” “He ran a great race under brutal conditions,” said fellow competitor Richard Ehrlich, age 60, whose time was 5:27:57. Nawoj aspires to complete a marathon on all seven continents. He has one to go, Africa, and will choose between either the run in Marrakesh or at Kilimanjaro. In Antarctica with Nawoj was a friend, Myles G. Osborne, Ph.D. ’08 (in African history), of Warsash, Southampton, U.K. The former Cabot House tutor, now at the University of Colorado, Boulder, finished the run in 5:33:10. He had a top-of-the-world adventure on Mount Everest in 2006. “It was 7 a.m. on the morning of May 26, and Osborne and his team had been climbing for over seven hours since the night before,” the Harvard Crimson reported. “They were in their tenth week on Mount Everest, and it was their third attempt at reaching the summit,” 492 feet above. Then they saw a man at trailside sitting three feet from a 10,000-foot precipice and inching toward it. He later said he thought he was on a ship and wanted to get off. He was removing his protective clothing piece by piece. He had reached the summit the day before, but became delusional on the way down from lack of oxygen. His guides said they tried to get him down the mountain but finally left him for dead. Osborne and his team gave up the idea of summiting and instead saved Lincoln Hall, a 50-year-old Australian. “Mount Everest is just a big hill,” said Osborne. Read a book of Harvard history. That’s cool. Edward Tabor ’69, M.D., of Bethesda, Maryland, reports: “I recently came across Harvard Scholars in English, 1890-1990 (Harvard University Press, 1991, long out of print), edited by W. Jackson Bate et al. It is a collection of biographical sketches of 21 professors of English. In the late 1960s, I was an enthusiastic English concentrator, but I was surprised now to learn so much about the English department of those years. For instance, Professor Douglas Bush was known among the faculty for his extraordinary memory, and he had memorized the approximately 11,000 lines of Milton’s Paradise Lost and recited them silently to himself to occupy his time on a train journey to Chicago. I was surprised to learn that Professor John M. Bullitt, the first master of Quincy House, had been one of the 268 Harvard sophomores enrolled in the Harvard Grant Study of normal development. Participants were anonymous, but Professor Bullitt revealed his role and told his colleagues, ‘When they follow us out to our later years, they will get a shock.’ At the peak of his own career, he resigned his mastership to join the Peace Corps for two years in Bolivia. To read more about Harvard mountain climbers, see “Climbing the Wickersham Wall ,” on our website.